First, many thanks to those of you who helped us to chose the cover for this issue. You chose a positive tone with Roy in his prime, mounted on Trigger and looking confidently into the future. Your interest is very important to us as we continue into our 5th Year, trying hard to develop the hobby's leading vintage plastic toy publication. 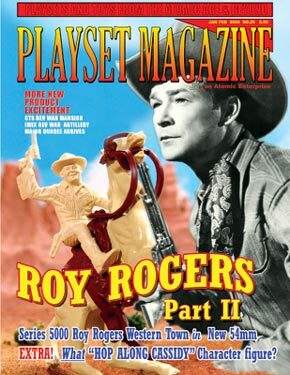 Roy Rogers Part II goes ever deeper into the legend, the times and the playsets. This time our celebrity co-host is Dustin Rogers, curator of the Roy Rogers Museum and grandson of Roy himself. He grew up with a legendary grandfather and saw it all with his own eyes. . Dustin is right there to give us a "you are there" look at Roy's career through the 50's and answers the crucial question "Has the Time of the Cowboy Passed?" He stays with us as we leave the large 60mm figures behind and take a complete look at the "new" 54mm sets of the late 50's and 60's. After the tumultuous introduction of the Roy Rogers character figures, Marx finally gets the group settled in with a beautiful "TV Memorabilia" quality character set. There are more new Cowboys introduced too, and then the mixing really begins. 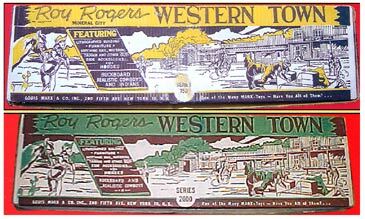 Marx Creatives did some of their best work at this time evidenced as we savor the highlights and changes to Mineral City, the ever popular Western Ranch, and complete our journey with the final Roy Rogers set from Sears. Its exclusive, elusive, and expensive! We've already answerd what the first Roy Rogers Playset was. Now, can we seek out and answer the question: WHAT WAS THE LAST ROY ROGERS PLAYSET? You bet! And its all right here, in the this blazing issue of Playset Magazine! WHAT Hopalong Cassidy Character Figure?